Elephants are amazing. They are beautiful creatures. Intimidating, yes, but beautiful all the same. And when you get to ride them…well, I’ll get to that later. The first elephant park we visited was called Elephant Nature Park. Of course. Here they brought the fortunate rescued elephants from their abusive Mahoot. (In Thai, Mahoot means the owner of an elephant.) Or they come if they have been injured while mining or in traps. Or if they have been rescued from one of the worst of the abusers. There is an awful way some people torture baby elephants. Why I say only baby elephants is because they only use this awful type of abuse on baby ones so they will learn from the beginning to do as they say or they will be punished. They call it the Crush. It is meant to crush their freedom, they say. Others say it crushes their souls. It’s awful. They don’t even give the little guys a chance. First, they separate the baby from the mother. It must be terrifying, because usually it will be the first time the child has been separated from its mother. Then they force the baby into a small wooden cage that nearly fits them. They will stay there for the next three days. They will tie the poor creature around the neck and legs until it can barely move. The people take sticks with nails stuck on the end and stab the baby in sensitive spots like the ear or the foot or the back of the legs. If the elephant resists, they will hit harder. They beat and hurt the poor baby until it is so cut and bruised there is nowhere else to hurt. Then they will let Lek, one of the few that has spent her time with these poor, lessening creatures, do their work. They will care for the cuts and wounds, giving shots of medication and drugs to help the pain and infection. This is most likely the only time they will get care or medication. Then they will take the baby away to the labor they will do for, most likely, the rest of their life. Logging, probably. This is one of the awful jobs they force these beautiful creatures to do. They attach big logs and pieces of wood and ride them up the steep bumpy mountain. A wonderful sweet elephant named Jakia was rescued from this awful fate. She has a very sad story. A few months before she was rescued, she had been pregnant while forced to labor. The men who owned her were still making her work the day she was ready to give birth. When she finally reached the top of the hill, she gave birth. But the poor baby just rolled down the hill and died. Jakia refused to work after that. Her owner shot a slingshot at her eyes and blinded one. She became angry and hurt him, and so he shot the other eye also, blinding both. After this she was rescued. But it was crushing to hear this story. We were able to meet this amazing creature, and see how her poor eyes had turned a milky white because of her blindness. But we were glad to be able to see such an amazing creature. 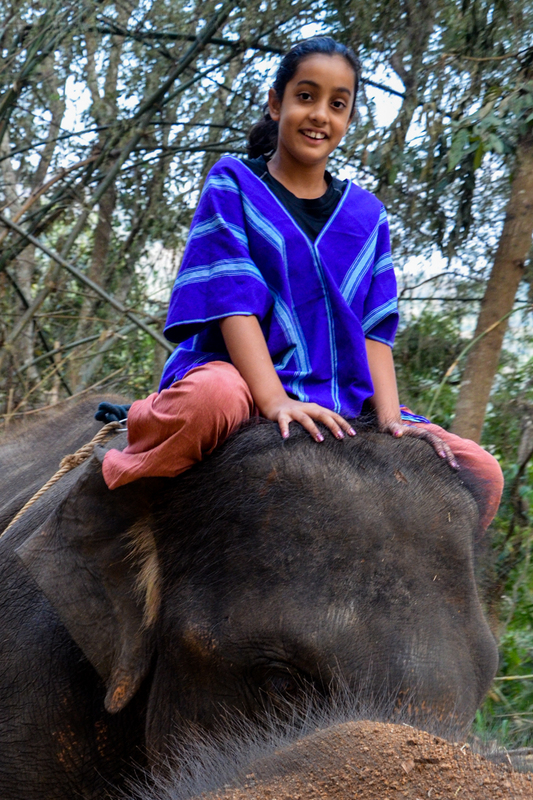 Then we visited Patara, the place where we were able to ride the elephants. I was so excited at first. I just got on and rode. It was amazing. The experience of such a fun adventure just made the rest of my time in Thailand worth it. It was…..something I can’t explain. I mean, you feel the same as riding a horse, but when you know you are riding a creature that could so easily have killed you whenever it wanted, how kind and allowing it was, it just breaks your heart to know that humans could actually hurt such beautiful creatures. I hope to enjoy many more experiences with animals along this trip and can’t wait to write about Africa!